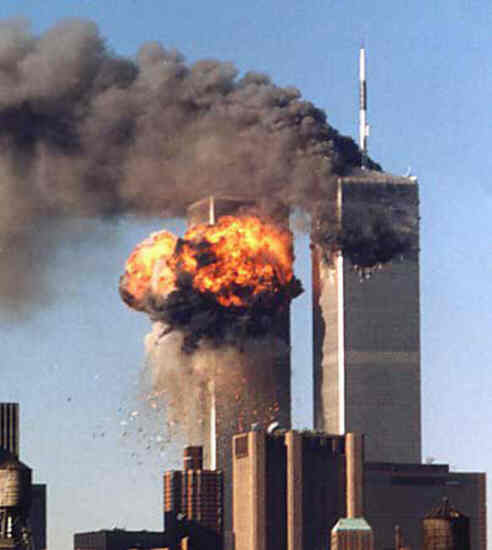 “New flames were emanating out from the south tower. We looked and waited for the person speaking to confirm it, but the newscaster did not yet recognize what we had witnessed LIVE! The wings and landing gear on the news helicopters and airplanes were in the way, preventing a clear view of both towers, causing me to subconsciously toss my arms to the left, “Get out of the way! Turn your plane around to get a better shot”! Frustrated, I changed the channel to get some answers. Within five minutes of the second plane hitting, Fox News called it a “suicide terrorist attack”, and NBC, “something deliberate”. TWO planes HAD hit the towers! A cold silence fell over our living room. What the hell was going on? The kids were just waking up and heading downstairs. My son asked, “What happened?” For a brief moment the four of us just stared at each other. As parents, we were speechless, but knew we had to tell our 3rd and 5th grader the truth: terrorist have just attacked America! Then something strange happened to me, which to this day I cannot explain; I just fell into the motions of Tuesday. It was 6:20 and I had to catch my foot ferry. I did what the clock told me to do. Trusting my husband to comfort the kids, I put on my commuting socks and tennis shoes then drove the mile down to the waterfront. The old Carlisle so lovingly restored sitting at the end of the dock talked to me; “I’ve made it through two World Wars and I’m still floating. Everything will be OK”, but I did not listen. This little boat would carry me across the Sinclair Inlet to the main Washington State Ferry terminal for Kitsap County in Bremerton. Hopping onto the boat, I headed right for the cabin to find a seat. Instead of viewing Port Orchard’s hills of classic homes and evergreen filled ravines, as I normally would from the stern, I sat in silence, along with four other passengers. It was hard to tell by their quiet demeanor if they were in shock by the events that just unfolded or if they had not yet been made aware. 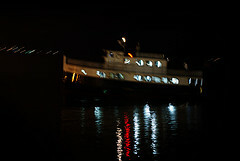 Judging by the sleepy atmosphere that normally enveloped the boat, I believed the latter. I didn’t want to say anything, perhaps I didn’t know WHAT to say. I couldn’t tell them what had happen. It was nice just for a moment to believe, that it was Monday morning and everything was normal again.